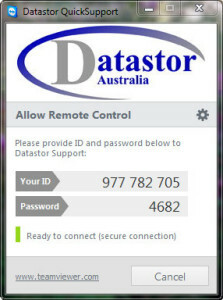 Datastor offers secure remote support via Team Viewer. TeamViewer is the All-In-One Software for Remote Support and Online Meetings. It allows remote control any computer or Mac over the internet within seconds. It can also be used for online meetings. When you click the link below, a download will automatically begin. (Size is 4.5MB). 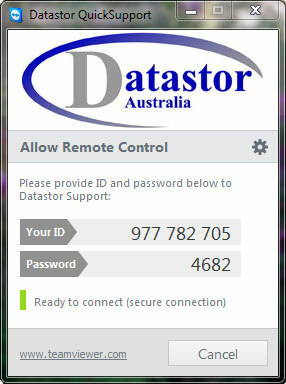 As indicated in the screen “Please provide ID and password below to Datastor Support”. When we have this we can begin the remote support. Please note that the ID and password is only valid for the current session and cannot be re-used.